I finally played a new Pikmin game yesterday, which I've been waiting to do for eight years. The game looks great, but the tiny sliver I played got me wondering what the best way to play the game will be. Ah, Pikmin. It&apos;s been too long, my little friends. Too long. The E3 demo I tried runs on the Wii U and lets you control the game with either the Wii Remote and Nunchuk or with the Wii U GamePad (that's the controller with the big screen in it). 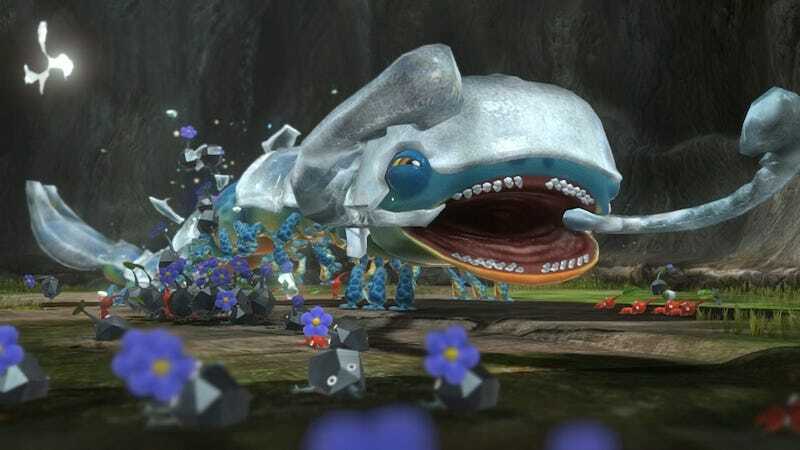 The demo is showing a special challenge mode that runs on a timer and tests the player's ability to command the Pikmin to find objects that they can cash in at their base for coins. You can't plant Pikmin to grow more of the little guys. You can't build a spaceship. Not in this mode. It's all about combat, collecting and finding sleeping packs of more Pikmin. If you play the game with a Wii Remote and Nunchuk you move your spaceman leader around with the analog stick, direct a cursor to point the Pikmin to their next objective by pointing the Wii Remote at your TV, and use buttons on the Wii Remote to either whistle the Pikmin to attention or toss them at the enemy you want them to fight, the pellet you want them to collect, the wall you want them to break, etc. You can re-center the game's camera with a button on the Nunchuk, if memory serves, but I couldn't find a key input that I used when I played the first two games on the GameCube: the ability to stretch your Pikmin swarm into a straight line and wrap that line around enemies, pellets or against walls, all of which was mapped to the GameCube's yellow C-Stick. If you play with the Wii U GamePad, you actually do have access to two analog sticks. The left one still moves the spaceman, but the right... well, it doesn't do the GameCube C-Stick thing either. It rotates the camera. (The d-pad in both configurations, I should note, can make the spaceman roll laterally, left or right). The Nintendo rep who showed me the game wasn't sure if Pikmin 3 will have the C-Stick-like functionality, so he advised me to just use the cursor to point the Pikmin at their goal and toss them. But how to point the cursor using the GamePad, which has no Wii Remote-like pointer sensor? You tilt the GamePad as if you were tilting a mirror to move a spot of reflected light around on a wall. This feels good, but, as with some other Wii U games, it requires manual re-calibration, fairly often, in order to re-set the cursors at the center point of the TV screen. You tap a button on the GamePad to re-center. It's not the end of the world, but it's another sign that the Wii U could use a tech upgrade in this regard. Whether you're using the Wii Remote configuration or the GamePad, a 2D world map will be displayed on the GamePad's screen. A rectangle on that screen represents the portion of the level that is displayed on your TV. You can drag your finger on the map and move the rectangle to quickly look at other parts of the game world. This is exactly like moving the viewing window in a real-time-strategy game, which, ultimately is what Pikmin is. I'd have to play more to determine which controller configuration I prefer. One Nintendo rep told me he likes the Remote version. Nintendo's chief game designer, Shigeru Miyamoto, told me internal Nintendo developers have been mostly playing with the GamePad version. I instinctively have an affinity for the old GameCube controls, but Nintendo typically doesn't ship a game before its controls have been perfected. Hopefully they'll figure out the best scheme or schemes before launch. Regardless, this game looks and plays like a Pikmin. Sure, the rock Pikmin are new, but this game seems like one of those sequels that is more evolution than revolution. It's been absent so long, I don't mind that a bit. We'll have more on Pikmin 3 in the near future.